Undertake garrison duties in the UK and so replace regular units. The result was an enormous success. Out of an establishment of 1100 from all ranks, 17 officers, and 400 OPs volunteered for foreign service, and a further 500 were ready for garrison duty. Between 10th and 15th December 1899, the British troops suffered three defeats at Stormberg, Magersfonstein and Colenso and this led to a large force being organised in Britain for a counter offensive and the relief of three besieged towns, Ladysmith, Mafeking and Kimberley. As part of this response, the City of London promised the formation of a battalion, 1000 strong, including 250 mounted infantry for which they would give complete financial support. Field Marshal Lord Wolseley, the C-in-C agreed and en-titled the unit, the City of London Imperial Volunteers (CIV). Also, late in 1899, the War Office authorised one volunteer company to join each line battalion in South Africa. The London Irish contingent for the CIV paraded on the last day of 1899 under Captain EG Concannon, who was known as a very competent horseman. 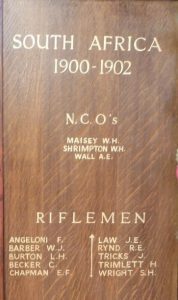 With 26 marksmen, they marched to the Guildhall to be enrolled, In addition, other officers of the London Irish were already serving in South Africa, one in the Imperial Light Horse and one in a volunteer ambulance unit as well as Lt Monypeny. The CIV sailed on the planned date and it is recorded that of the 26 other ranks, casualties were very few, but Cpl WH Shrimpton was killed in action at Fredericksrad. Captain Concannon was awarded the DSO, before returning to England on 26th October 1900. Meanwhile the London Irish service company did not sail for South Africa until 11th May 1900 and the draft for the 2nd Royal Irish Rifles (RIR) also included a section from the 2nd Tower Hamlets and one from the 15th Middlesex (Customs and Docks). The draft was commanded by Captain GC Henty, London Irish Rifles, who was accompanied by Lieut GE Hayes–Sheen, also of the London Irish. The 2 RIR, who had sailed earlier in 1900, had suffered severe losses during the fighting and, in addition to the London Irish service company, another one was also on the way from the 5th Bttn Royal Irish Rifles (South Down Militia) to bring them back to full strength. The London Irish service company joined the 2nd RIR on 13th June 1900 and became known as ‘K’ Company. The first mention of the company being in action was at the beginning of October 1900 at Bulfontein when a Private was killed and other three ORs wounded, one of whom died later. Capt Henty and part of his company were then besieged in Bulfonstein for three months by the Boers, and there is a record of Captain Henty being appointed Assistant District Commissioner from 4th October 1900 to 5th January 1901. On 16th November 1900, the Boers attacked the Springhaunek post commanded by Lieut Hayes-Sheen and called on the garrison to surrender. Hayes-Sheen in charge of 45 men refused to do so and inflicted casualties on the Boers, and the London Irish held tight and the Boers gave up and moved on. There were no British casualties. They formed the garrison at Bulfontein from 25th September 1900 to 20th April 1901, when they entrained for a port to return home to England. The CO of the 2nd RIR complimented them on their professional ability, and Captain Henty and two other officers serving with him were mentioned in despatches. In March 1901, Lieut CJ Willey and 20 ORs left for South Africa as reinforcements and there were other reinforcements later as it is recorded by Col Howland Roberts that a total of 208 all ranks of the London Irish Rifles took part in the Boer War. Over 80 served with the Imperial Yeomanry and a further 20 with the Middlesex Regiment. In recognition of their contribution to victory, the London Irish Rifles were awarded their first battle honour ‘South Africa 1900-02′.